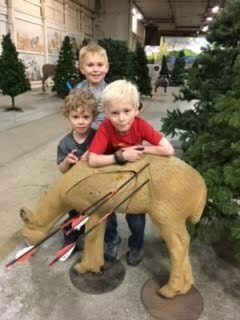 Dr. Rasmussen spends his free time teaching his kids to shoot guns and bows. 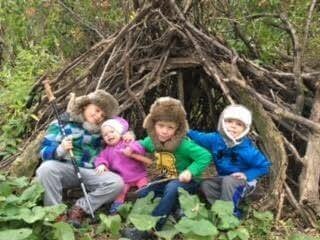 A family man, Dr. Rasmussen enjoys spending every spare minute with his four rambunctious children, Henry, eight; Ivan, six; George, three; and Olive, one. “I spend most of my days making sure no one shoots their eyes out,” he says. Dr. Rasmussen grew up on an acreage in Howard, S.D., where the primary activities for children consisted of sports and hunting. Most of his friends were farmers, so they had ample land on which to hunt and practice shooting. His father taught him to hunt, and Dr. Rasmussen remembers hunting pheasants and waterfowl and fishing in the nearby Lake Thompson. Once Dr. Rasmussen reached college, he became busy with athletics, so he didn’t have time to hunt. The busyness continued through optometry school. Then he and his wife, Sara, began having kids, so it has been over 15 years since Dr. Rasmussen has spent time shooting. Now that his children are growing up, he has enjoyed being able to teach them to shoot. 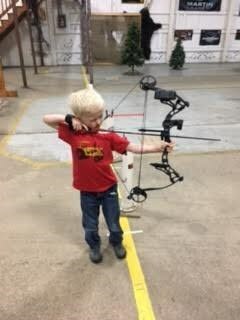 Dr. Rasmussen set up an archery and BB gun range in the basement so the kids can practice year round. This winter, the boys had the opportunity to shoot their first rabbit with their pellet gun, and then they helped clean it and prepare it for dinner. "The boys thought it was the best meat ever,” Dr. Rasmussen said. Dr. Rasmussen enjoys having the opportunity to spend time teaching his children shooting sports while also strengthening the bond between him and his children. Through teaching the children to shoot, Dr. Rasmussen hopes to teach his children to have gun safety and to respect and appreciate what God has created. Dr. Rasmussen enjoys the way shooting sports allow his family to spend time together. In the same way, Dr. Rasmussen’s contributions each day at Vance Thompson Vision allow him to build relationships with his patients. Because of his dedication to developing relationships of care with his patients, they can trust Dr. Rasmussen to take care of their eyes. Through Dr. Rasmussen’s care for his patients, he does not only help eyes see more clearly; rather, he helps people see more clearly through their eyes. Valuing the humanity of his patients allows Dr. Rasmussen to care with integrity for his patients by remembering the lives behind their eyes.